Sometimes, you have to search the four corners of the earth before you find that special someone with whom you want to spend the rest of your life. Nothing symbolizes that lifelong search better than a princess cut engagement ring, whose center diamond brings the proverbial four corners to your true love’s hand. Read on to find out why princess cut engagement rings are gaining popularity as the ‘Square to Wear’ in 2018! Princess cut is a relative newcomer to the diamond scene. Created in the 1960s, this edgy cut has gained popularity due to its clean, modern lines and intense sparkle. More than 50 facets make up a princess cut diamond, and these increase light dispersion for maximum fire and brilliance. Its geometry lends a delicate accent to long, slender fingers in particular, though it can be worn and enjoyed by all. Classic and refined, this piece offers understated elegance and unsurpassed comfort while highlighting your chosen princess cut center stone. The perfect width for pairing with any number of wedding bands, it’s versatile enough to create a wedding set that shows off the wearer’s true personality. Another reason people are choosing princess cut over round is the price. Because princess cut diamonds retain the four corners that make them square, less of the rough diamond goes to waste. As a result, princess cut diamonds are slightly more affordable than round cut diamonds of the same weight. When purchasing a princess cut engagement ring, be sure to choose a setting that protects the corners of the diamond so they are not exposed to daily wear and tear. This beautiful tapered engagement ring design is channel set with eight round shaped diamonds. A setting designed to draw the eye to the princess cut center stone of your choice. Princess cut is the second most popular diamond shape after round cut for good reason; it packs a lot of sparkle into a unique square form. 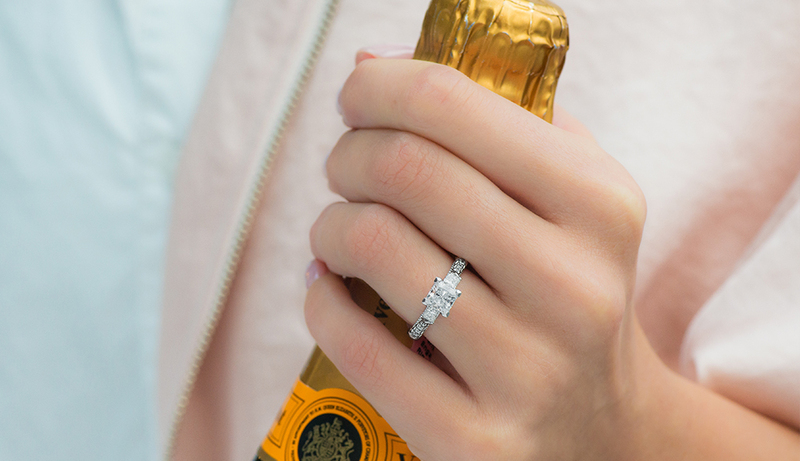 Celebrities like Kate Bosworth, Hilary Duff, and Snooki have all been spotted rocking princess cut engagement rings, and now it’s your turn to join the Quad Squad. We’ve rounded… er, squared up some of the hottest James Allen rings for your princess-perusing pleasure! This delicate version of the classic channel-set engagement ring features 20 channel-set princess shaped diamonds mounted into the shank around your princess cut center stone of choice. This gorgeous engagement ring features pavé set diamonds on the halo and along each side of the shank, highlighting your choice of princess cut center stone. For more princess cut inspiration, check out these striking sparklers in 360° HD. Would you be so bold as to wear a princess cut engagement ring? Let us know in the comments below or on our social channels: Instagram, Facebook, and Twitter. Be there and be square!